BANGKOK, 16 April 2011 (NNT) –The Thai traditional New Year’s Day is called Songkran Day. The word ‘songkran’ refers to the event in which the sun moves from one sign in the zodiac into another. The action has led to a Thai mythology involving a young prince, a powerful deity and his seven daughters. The myth begins with a battle of wits between the deity and the prince and ends with the task assigned to the seven angel daughters, all referred to as ‘Nang Songkran’, who have to take turns each year carrying the head of the deity around Phra Sumane Mountain. This gives rise to annual prophecies which change in accordance with Nang Songkran on duty, her position, attires, weapons, food and vehicle she is using. Nang Songkran for 2011 or this Year of the Rabbit is called ‘Kirini Thewi’. According to a senior official of the Office of the National Culture Commission, Tassachon Thepgumpanat, Kirini Thewi is dressed in emerald green with emerald ornaments, having Magnolia or Montha flower on one of her ears. She mounts on an elephant. Her food is nuts and sesame. 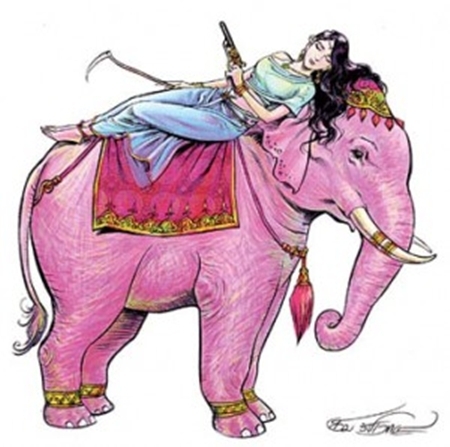 The goddess holds an elephant hook in her right hand and a gun in her left hand. Based on the prophecy in relation to this year’s Nang Songkran, Thailand will face with plague while people will die because of disasters and mishaps. Subordinates will listen to their superiors. Product prices will be expensive and the country remains fertile. Wildlife will be endangered. Widows will have fortune. Troops will have victory over their enemies. Meanwhile, astrologers in the northern part of the country, using the old Lanna teaching, interpreted that the rain this year will be adequate. Powerful figures will be in danger while livestock will die. Common people will live happily, but officials and monks will be in suffering. People born on Friday will be unfortunate but those born on Sunday will be lucky. Although the prediction in general is relatively pessimistic, Ms Tassachon noted that there are some positive points in the prophecy. Kirini Thewi is sitting on her elephant, the auspicious and symbolic animal for Thailand, which will purge evils. The preferred food of the goddess, which is nuts and sesame, also indicates that the country will be fertile while Magnolia or Montha on her ear is believed to be a heavenly flower with holiness and beauty. No matter how good or bad the predictions are, it is more important for all Thais to stay alert with consciousness in their living. People should take negative prophecy as a valuable caution to prepare preventive measures in advance in order to survive the crisis together.